On a cold and frosty morning, 13th of November 1715 the supporters of the exiled Stuart king, known as Jacobites and led by the lacklustre Earl of Mar faced the regimented ranks of the Government Redcoats led by the Duke of Argyll across the frozen morass of Sheriffmuir near Stirling. Over the next few hours the two sides hacked away at each other, neither gaining much advantage nor making any headway; but their objectives were very different. Mar had to cross the River Forth if he was to take his army on to Edinburgh; Argyll had only to stop him. As the sun set over distant Ben Ledi, the two exhausted forces drew back – the Battle of Sheriffmuir was over. It was inconclusive, no-one had actually won; but it was a strategic victory for Argyll and the government; his objective met. It was the end of the ’15 Rebellion. Although defeated, the Jacobite cause remained popular in the Highlands where chieftains still maintained sizeable retinues of fierce fighters, ready to strike again for the ‘King over the Sea’; and this was of considerable concern for the government. It was a worry, not only in terms of spontaneous rebellion against the establishment, but it kept a back door open for the warmongering ambitions of the French king, and it simply had to be brought under control; the independence of the chiefs and the clans had to be reigned in. However, the government in far off London knew as much about the Highlands as it did about the far side of the moon. 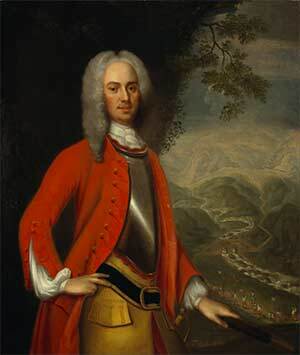 In 1724 George I sent north Major-General George Wade to investigate how best to solve the Highland problem. His research was thorough, his vision far-reaching and his report sobering. He suggested that the only way to tackle the issue of inevitable insurrection in the north was to build a series of heavily manned forts in key strategic locations and to link them together by building straight, high-quality and well maintained roads. Also, new regiments raised locally with the remit to ‘watch’ the Highlands should be created to provide a rapid-reaction force to deal with any rising, and stamp it out before it became a serious threat. A ‘Disarming Act’ was also passed by the Government to take swords and guns out of the hands of the clansmen – but, Wade rightly asserted that only loyal clans would hand their weapons in; and that building ‘Fortress Scotland’ was the only viable and long term solution. This and many other recommendations were accepted by parliament and the king, and in 1725 Wade was made Commander in Chief of North Britain, with the sole purpose of turning his conclusions into a reality. 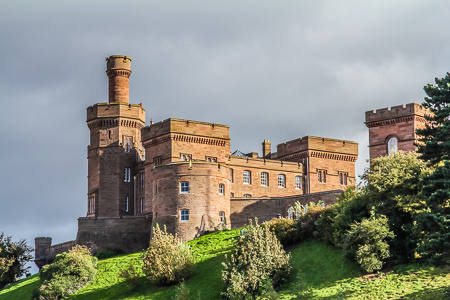 There was already a fairly ramshackle fortress at Fort William (originally built by Cromwell – and named for William of Orange) and a garrison at Inverness on another old Cromwellian site. But precious little else, save a few key castles such as Blair and Inveraray that could be held to protect key routes. So, Wade set about upgrading Fort William and Inverness (Fort George); and building new barracks and fortifications at Ruthven in Badenoch, Cill Chuimein, now Fort Augustus and Bernera in Glen Elg to protect the vital routes from Skye. But, key to the success wasn’t cleverly located military bases, but roads to connect them allowing the troops to move easily across the wild terrain of the Highlands, where there were precious few roads of any kind. It would be the largest civil engineering project in Scotland since Roman times. It wasn’t just a simple case of pitching up with shovel and pick and away you go; there were no maps, the terrain and weather was unforgiving; the natives restless and no blueprints to work from. Wade wanted to make his roads well graded, wide (16ft), properly drained and with a solid surface to take troops and carts. In some places he had to compromise, but for most of the 250 miles of road he built he stuck to these principals. At his disposal was an average of a hundred men, sometimes even 300; and they worked tirelessly through the summer months carving new routes across the mountains. Where they could they followed river valleys, with a minimal number of river crossings (originally all were forded, but in time most would be bridged) and as few steep slopes to traverse as possible. They would then spread out across the Highlands linking the forts, and in turn linking them to the major cities in the south. 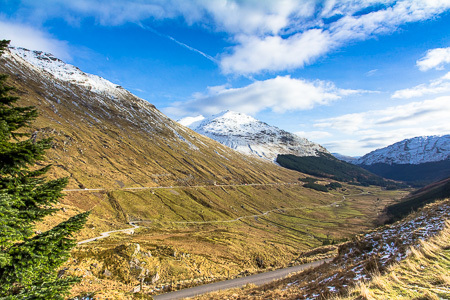 The first road, connecting Fort William, Fort Augustus and Fort George, was begun in 1727 and for the most part runs along the length of the Great Glen, and hugs the eastern shore of dark Loch Ness. Wade also put a gunboat on the loch for added firepower. It was a key highway through an important corridor, slicing through the heart of Jacobite country; his next road would be even more pivotal. At over a hundred miles, Wade’s road from Dunkeld in Perthshire to Inverness was the most important route, connecting the Highlands with Perth and Stirling. The modern A9 Highway pretty much follows the route as laid out by the general in 1728: past Pitlochry and Blair Atholl, before the crossing the bleak Drumochter Pass into Speyside. From Carrbridge the road traverses the wild bounds of the Slochd before journeying Drumossie Muir and down the steep slopes in to Inverness and the fort up on the hill (site of the present Inverness castle). To emphasise the singular importance of the route, about half way along he constructed the Ruthven Barracks near to Kingussie. This had always been key strategic location and guarded the medieval routes through the mountains. In addition, a link road was built connecting this Highland Highway with Crieff and Stirling. This road, built in 1730, includes the famous bridge at Aberfeldy – which still stands and still carries main road traffic. Wade decided not to run a road to Bernera; but did want to connect the main highways in the Great Glen and Central Highlands together; and this would prove his most audacious plan yet. This route, linking Fort Augustus with Dalwhinnie had one major obstacle in front of it: the thick block of the Monadhliath Mountains. The lowest and most accessible route was through the Corrieyairack Forest, but this would involve a 2500ft climb and over 18 switch-back traverses to cross. It was a feat of unparalleled engineering at the time; but, it was essentially unviable. Of all Wade’s roads this is the only one that never developed into a modern highway; but, it makes for a great long distance walk in fine weather. It was also the last major road built by Wade himself. He continued as the Commander, but the job of road builder passed to Major William Caulfield. Although not as famous as his predecessor, Caulfield is responsible for nearly four times as much road than Wade across Scotland. Among his principal routes are the long road north from Loch Lomond to Fort William across Rannoch Moor including the dizzying Devil’s Staircase; The Rest and Be Thankful from Loch Lomond to Inveraray; and a road from Blairgowrie to Inverness through the Eastern Highlands via Braemar and the Lecht Pass. In 1803, with the roads no longer needed for military purposes (the Jacobite threat having been crushed at Culloden in 1746), and in a state of terrible repair, they passed into the control of the Commission of Highland Roads and Bridges. A new survey was sent north to look at the state of affairs, and to assess what use the roads and the network would serve going forward: and whom. It was drovers, merchants, travellers and the like that now travelled where soldiers once marched; and the roads needed to be upgraded and improved to meet new social and economic requirements. Thomas Telford, the great Scottish engineer was responsible for upgrading, straightening, widening and generally improving the efficiency of the network. This involved building some truly impressive bridges, such as at Dunkeld and Craigellachie. The modern road network of the Highlands evolved from these improvements; but the essential plan of the system is still fundamentally based upon the military roads built by Wade and Caulfield over 250 years ago: a truly lasting legacy from a different age. This article was written by David McNicoll, who runs Vacation Scotland – Image of Ruthven Barracks by Vclaw under cc license.